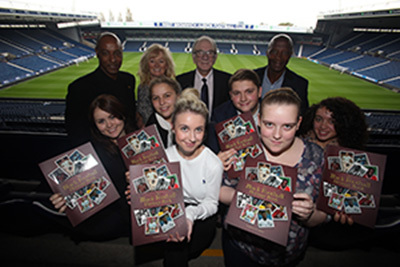 Black football heroes have been celebrated in a unique new book with contributions by students from Sandwell College. 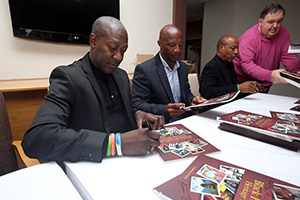 The very first book to celebrate the enormous contribution made by black footballers to the English game over the past 125 years was launched at The Hawthorns, home of West Bromwich Albion FC, with a special signing by trailblazing legends Cyrille Regis and Brendan Batson. Sixth form and photography students scoured their parents’ and grandparents’ attics, ebay and antique shops for memorabilia to contribute to the book and researched player profiles as part of their workgroup tasks. Supported by the Heritage Lottery Fund, The Black Football Heritage Book has been compiled by Jim Cadman and features original photographs, statistics, memorabilia and illustrations. Among the football pioneers featured are Arthur Wharton, who became the world’s first black professional player when he signed for Rotherham United in 1889, and West Bromwich Albion icons Laurie Cunningham, Brendon Batson and Cyrille Regis. Lord Herman Ouseley, chairman of Kick It Out, has written the foreword to the book and the first copy to be printed has been sent to the Center for Civil and Human Rights in the US city of Atlanta, at the request of Martin Luther King III. 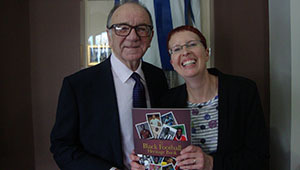 Jim Cadman said: “The book examines the heritage created by over 50 individual black footballers, many of whom ignored racism on the terraces and became role models and mentors for future generations. We hope that it will encourage and stimulate readers to look further into the careers and achievements of these remarkable players. “The students got valuable skills from this project and they learned what it was like to be a team player. 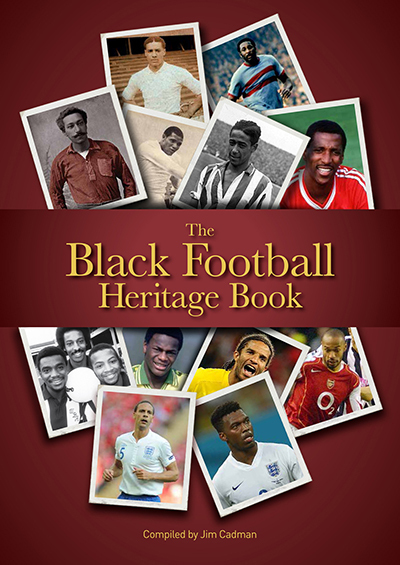 The Black Football Heritage book is being distributed free of charge to schools, academies, libraries, community groups, youth groups, football clubs at grass roots level and voluntary organisations throughout the country. Q. When did you first have the idea for the book – what was you primary influence? JC. The book was inspired by the 125th anniversary of Arthur Wharton signing for Rotherham Town in 1889 to become the world’s first Black professional footballer and realising that it had taken 90 years before Cyrille Regis, Brendon Batson and Laurie Cunningham had provided the motivation for young black players to become professional footballers. In addition there is an enormous gap in the market for this type of book. Q. In your speech at the launch you mentioned that the book would raise more questions than give answers, was that your intention and why? JC. The biographies of the players are short and compact and we want to encourage people to research the deeper background for themselves. Heroes to generations, Dave Bennett, Cyrille Regis and Brendan Batson. Q. How important was it to have students of Sandwell College involved in the book and why? Q. What was the lowest point for you personally in the project and what was the highest point in the project? JC. No low points but the positive reaction from the Professional Footballers Association, The Football Association, Lord Ouseley at Kick it Out and Martin Luther King III has be very rewarding. Q. To what extent do you feel The Black Football Heritage book can inspire young people? JC. The book has already inspired readers and students to look at their own heritage and link it with the plight of black footballers. We have encouraged them to talk with parents and grand parents to create an inter generational understanding. There are many examples of individuals in the book who have provided inspiration. Q. Why do you think it’s taken over a hundred years to acknowledge black footballers in the form of a book? JC. I am at a loss to understand but let us hope that this will in a small way provide a spring board for more focus in this area and convert the rhetoric into action. Q. Do you feel the book contextualises modern day football, if so how and if not why not? JC. Present day footballers are featured in the book including Liverpool’s Raheem Sterling and Daniel Sturridge, Danny Welbeck from Arsenal and West Bromwich Albion striker Saido Berahino, who is currently the leading English goalscorer in the Premier League. Q. In your opinion do think the custodians clearly get it in terms of black footballers heritage in the English game? Q. Can you tell us how important you feel the timing of this book is in terms of all matters equality in football and institutional racism in the sport? JC. The timing is pertinent as the global game is still plagued by racism. Only this week CSKA Moscow played Manchester City behind closed doors following racist chanting by their fans. Q. In the light of the Premier League and the win at all costs culture that the professional game continues to court, do you feel that The Black Football Heritage Book resonates more with people up against the odds, if so why? JC. I hope that the book will appeal to all sectors of society, though of course the stories of the players featured will resonate with people who have suffered racism during their lives, whether they were born in Britain or have moved here from overseas.